Since it was first presented to the world in 2016, the Presage collection has showcased two central aspects of the character of Seiko, our respect for traditional Japanese craftsmanship and our long-established skill in mechanical watchmaking. The 2018 Presage collection again provides a vivid demonstration of Seiko’s ability to explore new avenues of development in both these areas. Shippo is a particular type of enamel that was developed in Japan in the 17th century. Its main difference from porcelain enamel lies in the way it is polished after firing, a process that is particularly challenging on a watch dial that is no more than 1 mm high. The Presage Shippo enamel dial is made by Ando Cloisonne, a specialist manufacturer in Nagoya with over 100 years of history. Craftsman Wataru Totani paints the glaze by hand onto the surface of the dial. To ensure that the dials comply with Seiko’s high ecological and safety standards as well as the EU’s RoHS Directive, he uses a lead-free glaze specially developed for these watches. The dial is then fired at 800 degrees Celsius. The painting and firing processes are repeated several times to ensure the evenness of the enamel. Only when Totani is completely satisfied is the dial polished so that the delicate pattern emerges and a perfect, smooth surface is achieved. 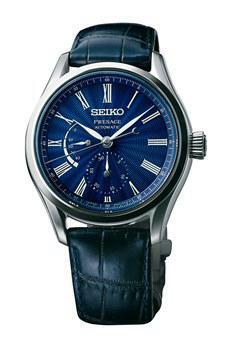 The dial on this new Presage creation is in a deep blue that mirrors the color of the ocean. It is via the ocean that Japan has absorbed elements of the cultures of other nations but it is equally true that the ocean has also isolated Japan from outside influences. Thanks to this ambivalence, many aspects of Japanese life, from art to industry, have arrived from across the oceans but, once in Japan, have developed in a uniquely Japanese way. Shippo enamel craftsmanship is a perfect example; it arrived from across the seas but, once here, evolved and matured in a Japanese way. Seiko proudly shows its respect to the role of the ocean in shaping Japanese traditions in the Presage Shippo Enamel Limited Edition. The deep, long-lasting blue of the enamel reflects the everlasting blue color of the seas around Japan and the dial pattern echoes the continuous motion of the waves that break on our shores. A new caliber and a new profile for Presage. We are proud to announce the creation of a new automatic caliber, 6L35, in the Presage collection. This new caliber has been designed for slimness. It has higher specifications than our trusted and much admired 6R15 caliber but is just 3.7 mm in depth, or 1.3 mm slimmer. 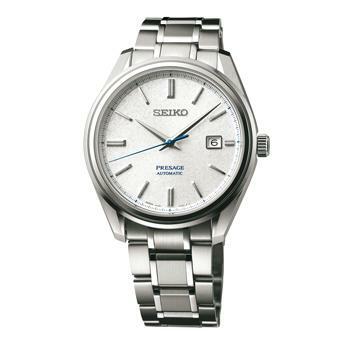 This new watch is offered in a limited edition of 1881, in recognition of the year in which Seiko was founded. Not only is the movement itself thinner, but the new case construction allows the slimness to be accentuated. The movement is inserted from the front of the case which allows the sides to be angled inwards and for the watch to sit more comfortably on the wrist. Of course, this construction requires that the bezel is removed when the watch is opened for servicing so, to ensure the watch’s durability, the bezel is screwed down and covered with a secondary bezel to preserve the perfect lines of the case. The watch itself is truly worthy of this remarkable new caliber. The case is polished using Seiko’s Zaratsu technique and is protected by a super-hard coating. The sapphire crystal has a super-clear coating to ensure high legibility in all conditions. 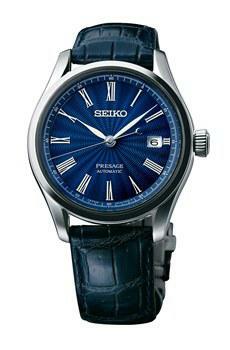 The second hand is in blue tempered steel and the dial has a delicate, textured pattern.